1834 Investments Limited (1834 – formerly The Gleaner Company Limited) has advised that the Audited Annual Financial Accounts for March 31, 2016 will regrettably be late and unavailable for publication by May 30, 2016. 1834 anticipates that it should be available for publication on or before June 30, 2016. Terry Peyrefitte of 1834 Investments Limited, inserts the company’s new name strip onto the JSE listing board at the name changing ceremony held on Monday April 4, 2016. Looking on from second left are Hon. 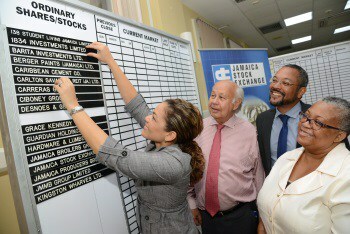 Oliver Clarke, Chairman, Christopher Barnes, Director, and Marlene Street-Forrest, General Manager of the Jamaica Stock Exchange. The Gleaner Company (GLNR) has advised that The Gleaner Company (GLNR) & Radio Jamaica Limited have applied for the court’s sanction of the scheme of arrangement for amalgamation and that the matter is set down for hearing on February 17, 2016. The Gleaner Company Limited (GLNR) in keeping with the 180th Anniversary share offer option transferred a total of 509, 034 shares by the Gleaner employees Investment Trust to the company senior managers. The Gleaner Company Limited (GLNR) has advised that its Extraordinary General Meeting will be held at the Wolmer’s Girls’ School, 2a Marescaux Road, Kingston 5, on Wednesday, December 30, 2015 at 10:00 a.m.